Find out all about the latest Fairtrade news and events in Preston and South Ribble, or take a look to see what we have done in the past. Drinks & snacks available/ A warm welcome for all. Fairtrade Wine Tasting at the United Reformed Church in Fulwood. Come and join us for a relaxed evening of wine tasting led by an expert with a talk about Fairtrade wine producers. Snacks will also be provided. The event begins at 7pm for a 7.30pm start and costs £12 per ticket. Come and see us on Preston Market on Saturday 2nd March. On our stall we will invite people to have a dip in the chocolate fountain, play our special bagatelle game, and sign a card calling of a living income for the people who produce our chocolate. They can also show solidarity by purchasing from our large selection of Fairtrade chocolate on sale at the stall, including some very special bars made locally from Fairtrade chocolate and packaged exclusively for Preston by Elliechoc a local ethical chocolate company. Added Tuesday, 26th February 2019 Location: Preston Markets, Earl Street, Preston, PR1 2JA. Planning meeting, 1.30pm. All welcome. Join us at Preston Market. What new Fairtrade products will you find? Come on in and we will show you how to fit Fairtrade into your breakfast, your dinner and your tea, with samples galore. Enjoy the chocolate fountain and have a go on our Fairtrade tombola. All day. The Discover Fairtrade Gold photo exhibition - tells the story of how marginalised gold mining communities in Africa & South America are improving their lives and communities through Fairtrade. Dirty Gold War - uncovers the human and environmental cost of our obsession with gold. The film is a trip behind the scenes of a thriving industry. On one side, the displays of luxury goods; on the other, the appalling conditions of those cursed by dirty gold. A film that changes the viewer’s perception of this business and contributes to the fight for responsible ethics in gold. Planning meeting for Fairtrade Fortnight, 1.30pm. All welcome. 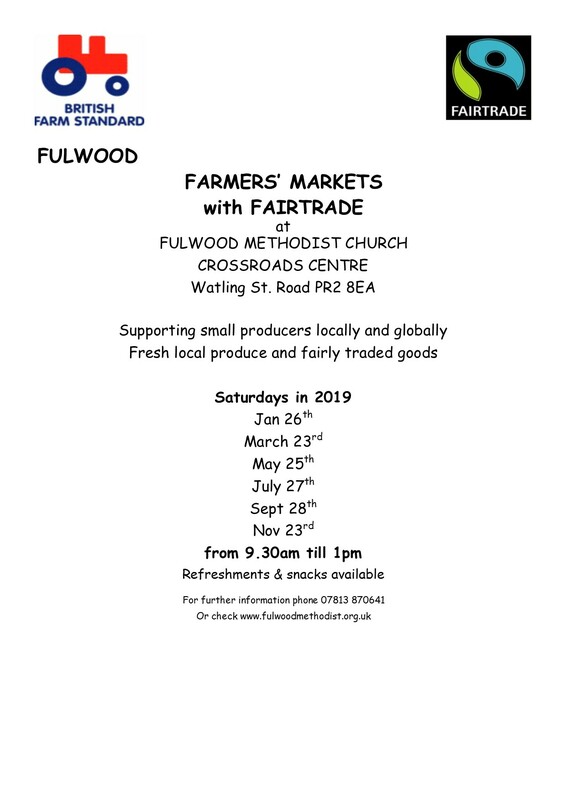 The first Fulwood Farmers' Market with Fairtrade of 2018 will be held on Saturday 27th January from 9.30am-1pm at Fulwood Methodist Church Crossroads Centre PR2 8EA. Come and stock up on fresh local produce and Fairtrade products, and enjoy a chat over a drink and a snack. A warm welcome for all. The Fulwood Christmas Farmers' Market with Fairtrade will be held from 9.30am till 1pm supporting producers locally and globally, with fresh local produce from around the area and a selection of fairly traded food and crafts from around the world. There will be a variety of gifts for Christmas plus Christmas cards and food, as well as everyday items. There will also be all the normal Farmers' Market stalls, with local produce from meat, pies, preserves and veg, to eggs, cheese, bread and cakes. Come and browse for that special Christmas gift or stock up on Fairtrade and good local food. Raffle, drinks and snacks. All welcome. Members of our group joined members of Fairtrade Lancashire to have a presence at the Lancashire Show, with games, raffle and stall. Event: Keeping Hope Alive with Olive Oil and Soap - a talk by Susan Murphy. Susan will talk about the plight of the Palestinian olive farmers, their products and the problems they face. All are welcome to join us for this talk which follows the AGM at 7.30pm (refreshments) for a 7.45pm start. Annual General Meeting of Fairtrade Group, starting at 6.30pm. Join us any time between 10am - 4pm at our stall on Preston station. We will be handing out information and free samples and encouraging people to join us for a Fairtrade Break and reflect on the issues surrounding Fairtrade and how we can all make a difference. MP Mark Hendrick will take a break with us at 10.30. Film evening starting at 8pm.. A special screening organised by Preston & South Ribble Fairtrade Group at The Continental Pub in Preston. Connected by Coffee is an inspiring and thought provoking documentary about the lives and history of the people who grow the coffee we drink. Tickets available from the Continental, from group members, or on the door. Join us any time between 10am - 4pm at our stall outside the Oxfam Shop in Preston. We will be handing out information and free samples and encouraging people to join us for a Fairtrade Break and reflect on the issues surrounding Fairtrade and how we can all make a difference.